Your iPhone, iPad and just about every relevant tablet and smartphone on the market is made with this incredibly resilient glass. And now it's even tougher and more durable than ever. It was only a year ago when Corning released its second generation Gorilla Glass, and now it has officially announced of a third iteration dubbed Gorilla Glass 3. Corning's Gorilla Glass 3 features a new proprietary process called NDR (Native Damage Resistance), which significantly reduces the appearance of scratches by as much as 40% while improving the strength of the glass compared to Gorilla Glass 2. Gorilla Glass 3 has been improved at the molecular level, incorporating a proprietary feature called Native Damage Resistance (NDR). According to Corning, NDR reduces the propagation of flaws, the appearance of scratches and does a better job of maintaining the overall retained strength of the glass. As a result, GG3 claims a three-fold improvement in scratch resistance, 40 percent reduction in the number of visible scratches and 50 percent boost in retained strength after the glass becomes flawed. In addition to Gorilla Glass 3, Corning will also unveil its fiber optic-based Thunderbolt cables designed to significantly extend the data transmission range past the limits of copper-based Thunderbolt cables. 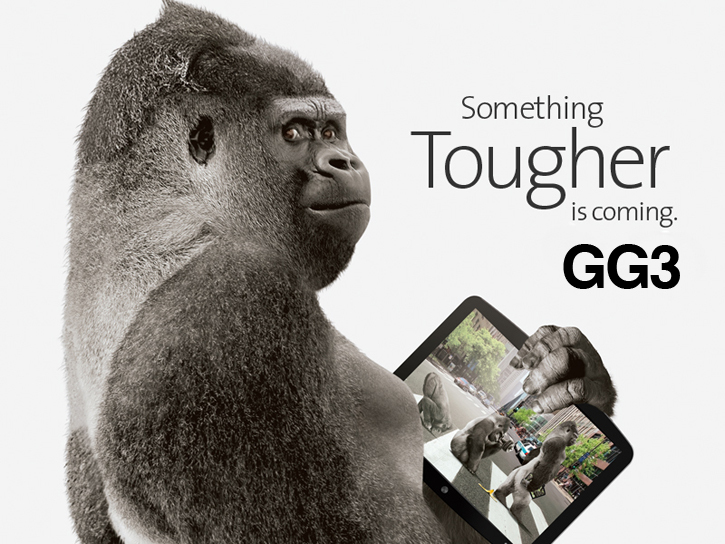 Corning will display and demonstrate the toughness of its Gorilla Glass 3 at CES.